Based on recent media reports, many people may think that, because of the tough economy and stagnant wage growth, more and more people are working multiple jobs. You may have read that more Americans are moonlighting with a part-time night shift at Target, selling homemade jam at farmers’ markets on the weekend, or cobbling together two, three or more part-time jobs to approximate a living income. However, that assumption would be wrong. Both in terms of raw numbers and as a share of all employed people, fewer Americans are working more than one job than in the mid-1990s. 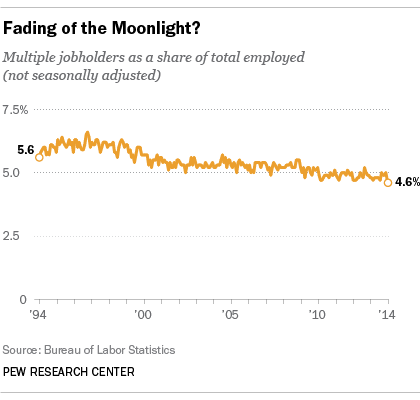 Working two jobs or more has become less common, not more, since the end of the Great Recession. According to the federal Bureau of Labor Statistics, as of July nearly 6.8 million Americans worked more than one job, or 4.6% of all employed people. (The August jobs report, which will contain new data on the number of people who work multiple jobs, is scheduled to be released Friday.) Since the recession’s official end in June 2009, the average monthly number of this group has been just under 7 million — about half a million below the average during the 2001-07 expansion, and nearly 800,000 below the 1994-99 average. According to a 1990 article in the BLS’s Monthly Labor Review, the percentage of people who hold multiple jobs rose sharply during the 1980s: from 4.9% of all employed people in 1980 to 6.2% in 1989. The rate of this hard-working group hovered around 6% throughout the 1990s, peaking at 6.6% in November 1996, but has ratcheted lower since; the annual average rate was 4.9% from 2010 through 2013. There is, however, some support for the stereotype of multiple-job workers as being young and overeducated. People in their early 20s are, in fact, most likely to work more than one job: 5.8% did so on average last year, according to BLS data. And it’s true that those who have more than one job tend to be more educated: While only 2.2% of people who didn’t graduate high school reported working more than one job, 6.9% of master’s-degree holders and 6.8% of doctoral-degree holders did. Women were somewhat more likely than men last year to work more than one job (5.2% versus 4.6%). Whites were the most likely racial or ethnic group to work two or more jobs (5%); Asians and Hispanics were least likely (3.3% and 3.2%, respectively). 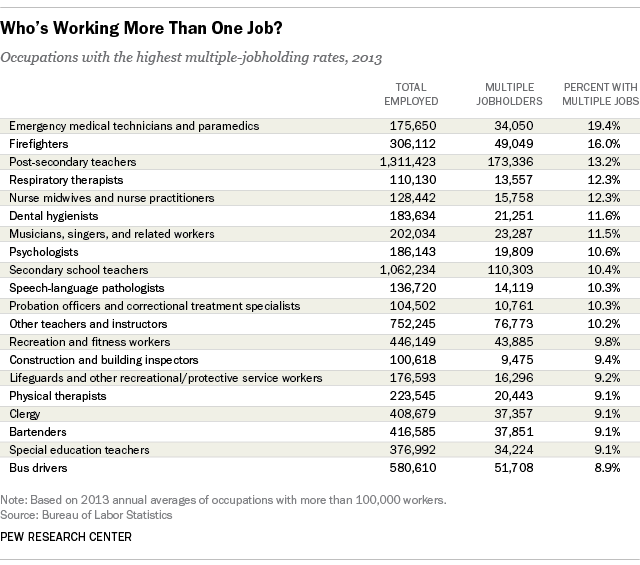 Public-safety workers, education workers and healthcare workers were among the most likely to work multiple jobs. According to the BLS data, 19.4% of emergency medical technicians and paramedics held more than one job, as did 16% of firefighters, 13.2% of post-secondary teachers and 10.4% of secondary-school teachers. Working multiple jobs is significantly more common in some states than in others, according to BLS research. Last year, the highest multiple-jobholding rates were in South Dakota (8.9%), Vermont (8.8%) and Maine (8.6%); the lowest rates were in Florida (3.4%) and Georgia (3.5%).